Last Christmas season (2017) Lori and I we were visiting with our dear friends Nancy and Frank and I was struck by the beauty of their Christmas tree. Do I remember how it was decorated in 2017? No. But I can tell you I was intentional in knowing that I wanted to photograph their tree in 2018 even before I knew how it would be decorated. I knew it would be amazing. And I was not disappointed. It was all about hope. Literally. And what better way to start off a new year than with hope. So what is this word, hope? According to the dictionary, hope is “a feeling of expectation and desire for a certain thing to happen.” It’s not a churchy word rooted in our belief in God. It is a word ingrained into who each of us is, whether we put our faith in God or not. Hope is what moves us forward. Hope is what we want even when we don’t know it. 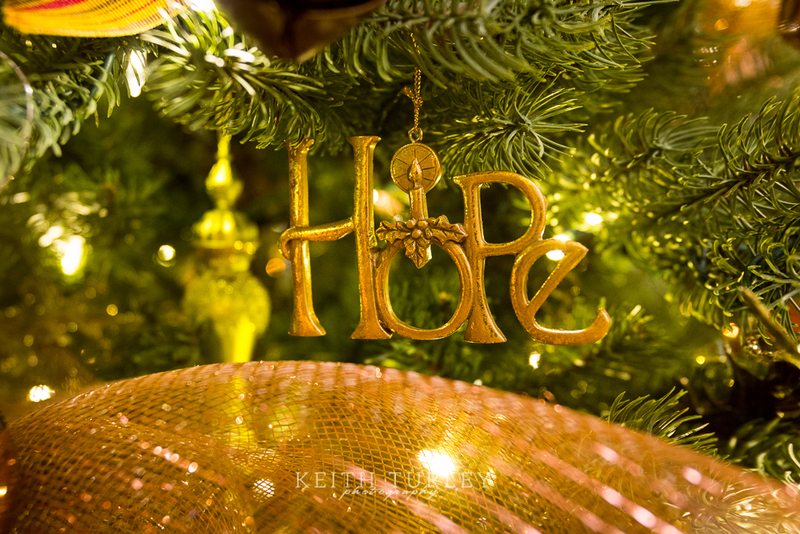 Hope comes in many forms: ambition, aspiration, concern, confidence, desire, optimism, endurance, expectancy, reliance. Look at a partial list the thesaurus gives as opposites of hope. Yikes. Who would want a basket full of these? Disbelief, dislike, distrust, doubt, fear, hate, despair, discouragement, pessimism. No thank you. Back to Romans 5. Does hope disappoint? I don’t think so. That for which we are hopeful may not come to fruition. We may set goals and not reach them. Yet the hope itself did not disappoint. Hope in and of itself will always move us towards something. That progress may not be immeasurable and may be more of a leaning than an actual step. But it is toward something. I want more hope. I want more of what Christ died for. He has hope in me, that I might draw closer to him. I want some more of that.